Five agencies in two states recently partnered to help a tiny population of Greater Sage Grouse avoid extinction along the California-Nevada border. 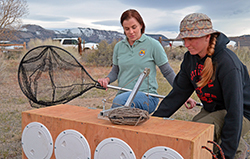 Biologists from the California Department of Fish and Wildlife, the U.S. Fish and Wildlife Service, Los Angeles Department of Water and Power, the Bureau of Land Management and the U.S. Geological Survey are working together in this first-of-its kind study. On April 22, the bi-state team of scientists captured, inseminated, transported and released 17 of these female upland birds to a new habitat where they will hopefully flourish and repopulate. Eight male birds were also transported to Bodie Hills as part of the study. The birds were captured near Bodie and moved to Parker Meadows, about 30 miles south. CDFW scientists have been tracking the number of Greater Sage Grouse in Parker Meadows for years, and it was evident that human intervention would be necessary to keep the group alive. Between 2002 and 2010, the number of males had dropped from about 17 to only four, and CDFW estimated that the entire population had a 70 percent chance of going extinct in the next five years. Translocation was chosen as the best option to save them, as it would not only boost the number of birds in the area, but also immediately widen the gene pool. Although biologists from the U.S. Geological Survey will be doing most of the hands-on work with the birds, CDFW biologists played an important role as well. Environmental Specialist Tim Taylor worked for months to obtain the proper land access permissions and assess the habitat near Bodie. Taylor identified several potential problems (including conifers, where raptors would likely perch while in search of prey, and barbed wire fencing) that needed to be removed prior to the relocation. And Senior Environmental Scientist Scott Gardner, in Sacramento, was instrumental in securing grant funding – without which, this partnership project would not have been possible. Read more about the Greater Sage Grouse study.